Because we are a family business, you will enjoy dealing directly with us, the owners - throughout your project. Superior customer service, and we guarantee to turn up on time, every time, and to complete your work within the scheduled timeframe. We will take the time to provide you with an accurate quote, and to discuss all facets and finishes of the work. Enter your details and our friendly team will call you for an obligation-free chat. If you are wanting to improve the look and value of your property for selling, for attracting tenants, or simply for your own living enjoyment, D R Main Floors can bring your polished timber floors back to life. We only use the best materials and machinery to create a top quality finish. When we sand your floors, we strip them right back to the bare timber, which reveals and refreshes the natural clear grain of your timber floors. This natural beauty is further enhanced when we apply the polish. We have over 25 years of experience in the flooring industry. This makes us the floor sanding specialists for you! It is important to erect drop sheets to cover doorways to open areas of your home that will not be having floors sanded. Our sanding machines remove around 95% of the dust. However there will always be some airborne dust that will travel throughout the premises. You may want to take down curtains, or drop them in large garbage bags that are tied to the tracks. Blinds are fully drawn up, or covered in plastic, to prevent dust collecting on them. Take down any low-hanging pictures and lampshades, or lift them to a higher point. All pictures that remain on the walls must be covered unless they are in glass frames. Air-conditioners should be covered with plastic sheeting. If you are pulling up carpets, tiles or vinyl, you must also pull up all gripper rods around the perimeters of the rooms, along with all staples, nails and tacks. The same applies when pulling up cork or ceramic tiles if they are on hardboard that has been stapled or nailed. This has to be done at least 24 hours prior to our arrival. We offer a floor covering removal service for an extra charge. You should also avoid storing things under your floors if there is no ceiling, as polish can drip through the floorboards. If you know you have an ant issue with ants coming into the house especially in the area’s to be sanded and polished you need to try and get pest control to kill them at the nest if possible prior to the floors being done. Do not spray pesticides on the floors prior to the floors being sanded as it can cause rejection problems with the polish. 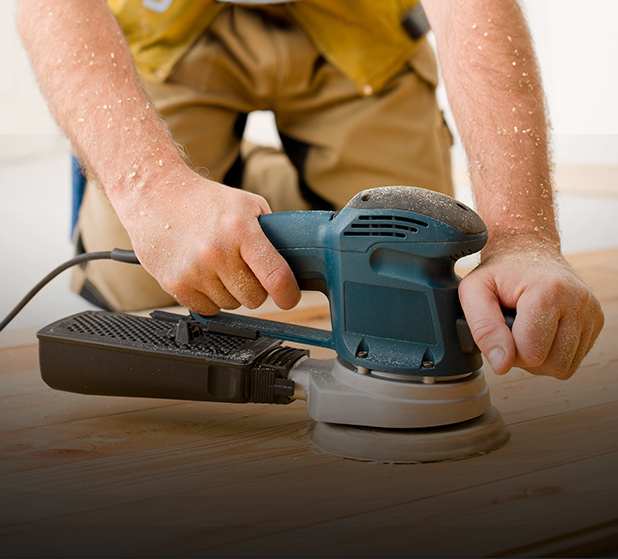 Thinking of sanding or refinishing your floors? We then commence the sanding processes using our 8” belt drum sanders, and our smaller edging machines. We generally do a rough sand on a 45 degree angle across the boards to help level the floor. We then will do what we call “grain out”, and then the “fine sand”stage. Through the various sanding stages, we use different grades of sandpaper, depending on the condition of the floors we are sanding. We look for things like low spots in the floors, existing defects due to bad sanding, dings, and stains, which we take out. We don’t just run a machine over your floors: we pay proper attention to them, and try to bring out the best in the timber. Once the sanding is complete, we attend to corner detail work, and then vacuum the floors. We then apply the first coat of polish. At the first coat stage, there is little or no film build, and the floors tend to look patchy due to the porousness of the timber. This day may also involve filling nail and staple holes, as there can be hundreds to fill by hand. We cut back the floor (depending on coating system used) and vacuum the floors. We apply the second coat of polish. At this stage, you can get a very good gloss level on some floors, and some even look good enough to live on. However, we never apply only 2 coats, regardless of how good the floor looks, as the industry standard is 3 coats. We cut back the floor, vacuum, and apply the final coat. Once the final coat has been applied, it is imperative that no doors or windows are opened anywhere in the house, as convection of the air can cause dust to fall into the polish, or bubbles to form due to premature drying. Using a professional will ensure the end result is not only visually appealing, but will also add instant value and saleability to any property. Only a professional can restore your floors to their former glory, and provide a flawless finish. We can take out most defects, and we only apply top quality coatings that we know will last a long time. You can rest easy, knowing we are fully licensed, and that our work is assessed and monitored to meet the high accreditation standards of both the QBCC and the ATFA. If your floor is being filled, you will need to allow an extra day to complete the work (4 days in total to complete). We sand parquetry with our big machines and our rotary Polyvac sanders. This is also a 3-day job to complete, and unfortunately produces more dust than sanding timber floors. You should expect a lot of dust from this process. Cork re-sands are very different to timber floor sanding, and they require a very high level of expertise to do properly. We sand cork with our big machines and our rotary Polyvac sanders. You must wait 24 hrs after the final coat has been applied before walking on floors. Need help with your floors?